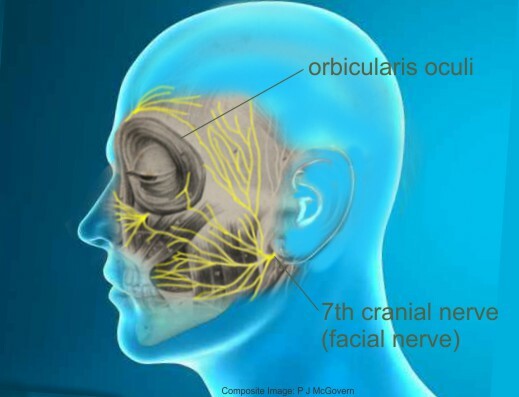 There is no single cause of BEB, however, we know that it is linked to an abnormal metabolic activity in the basal ganglia of the brain, resulting in excessive electrical impulses in the seventh cranial nerve, also known as the facial nerve. In some cases BEB may be genetic in origin, although the genes responsible have not been identified. The illustration shows the path of the seventh cranial nerve, also known as the facial nerve. The zygomatic branches are the ones leading to the muscles which control the eyelid, called the orbicularis oculi. Some people with BEB may also have apraxia of eyelid opening, a delay or inability to open the eyes in the absence of spasms. Cranial Dystonia, or Meige Syndrome, is a condition that combines eyelid spasms with other uncontrolled movements and contractions of the lower face. About a third of people with BEB may also have cranial dystonia. This pair of images shows a male patient, before and after a treatment for a case of Hemifacial Spasm (HFS). A condition that resembles BEB but is not a form of dystonia, is called Hemifacial Spasm (HFS). In this condition, the eyelid and muscles on one side of the face may contract uncontrollably. The cause of HFS is usually pressure of an artery on a facial nerve.